The old thread is about fetching the latest source code, so it might not be the most appropriate to track progress of the port, thus created this one (hope this is OK). Thanks for the update and the new screenshots. Please do post updates in this thread! I just wonder, as JIT cannot be enabled (not even compiled) on non-x86 machines (like Arm Androids), would it run faster if i roll back to non-JIT code version? In other words do anyone know, what is an [estimated] speed difference between Basilisk non-JIT code (older versions, like 142) and Basilisk JIT-code (but with JIT disabled?). Currently it runs a bit slow on the phone. Barely usable, if we wanted to do some serious works inside the MacOS. The Basilisk 142 build is a windows specific build. In my opinion it is the most versatile/feature rich version ever built. It performs wonderfully and allows setting performance options in many areas (through process priorities). The benefits of the JIT are clear, but I don't think the pre JIT versions were faster then the JIT disabled version you now have. Perhaps someone else knows better? The pre-JIT versions for Linux might also be more versatile compared to the JIT versions, as the develop focused more on performance and less on features when the JIT was introduced. You can see that the feature set of the current windows jit built is smaller than the old 142 version. However, along with development of the JIT also other problems were solved, so the current code should provide the best quality to base your build on. Do you also have plans to build a SheepShaver version? The JIT versions have better performance all around, but the 142 build has great floating point performance, better than the latest JIT from CVS. Checkout http://droidmac.blogspot.com You can [finally] get a works in progress there for your android device :). On my Defy it works quite fine, a bit slower than Mac IIfx, but still quite playable. On newer devices (1GHz+) it will probably fly :). I'm getting general result of 8.5 in Speedometer 3.06. Thanks for sharing the news... and for your hard work! I found out that for work I'll soon be getting a Motorola Milestone, so I'll finally be able to try Android out! Will be happy to test this port once I do. Sorry guys. Nothing personal to you, as this forum is simply great!, but I got so pissed that now DroidMac is dead . Details on the blog. Cheers. I read something similar on OSNews.com. I can understand your emotion, but at the same time feel sorry for the now stopped development. But still, is there anything that could be done to revive the project? I only recently got a Y300 Android 4.1.1 (in fact its my wife´s) and found that Tomek´s apk is running pretty smooth. What I am missing is a usable config for my 480x800 IPS screen. How can I enable a landscape screen? The setting is there, but DroidMac quits with an error if I select it. I already have MiniVMacII, which is great too, but a BasiliskII port would be very useful. 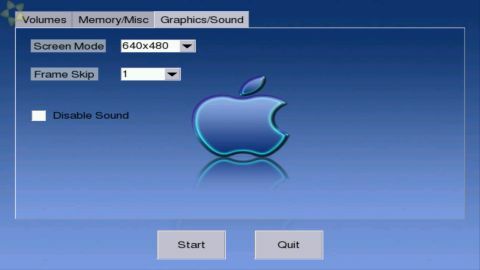 DroidMac already has virtual screens for Mac which can be scrolled on the Android screen, this really does look promising. It performs wonderfully and allows setting performance options in many areas (through process priorities). But you are wrong there: Basilisk build 142 was created in 2001 by one specific windows developer, who did a great job. The original developer kept the versions of BB/SheepShaver mostly in sync for all supported hosts. After he left the scene in 2008?, most improvements have been targeted at OSX. Nowadays, I guess, most users of Basilisk/SheepShaver are OSX users. Many, many thanks to you, Lubomyr! BII is finally working like a charm on the Huawei Y300-100, Android 4.1.1. 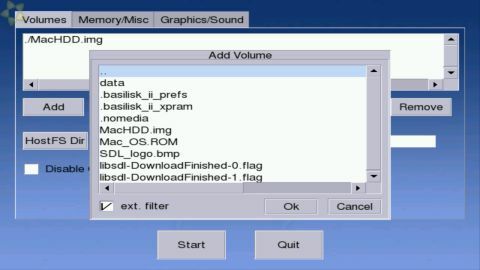 Due to the nicely customized Huawei system, the app and files are running from the external SD. I´ll soon try with my tablet. Spread the word on 68kmla too, BII on Android will sure make the day for some! Edit: Just got this on the Y300, not sure whether anything should be done. The emulator works fine and with sound anyways. I wonder why the DroidMac died. 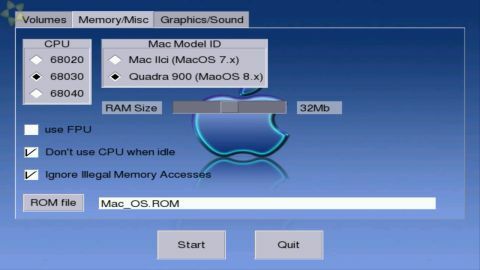 I also find an app called Mini vMac II which available on Google Play but not a freeware. It is a port of Mini vMac emulating Macintosh II. As it on PC, the sound emu is laggy. 2) Please rename memory.h (from UAE CPU engine) to memory-uae.h in github. Because name memory.h - not allowed to use with android ndk. 3) Please implement ARM JIT from Aranym 1.0.2 or higher. Aranym uses same UAE CPU engine. ARM JIT from aranym works at 2-3 times faster, and will be more faster soon. Basically I would like to keep all needed files on /mnt/external_sd/Basilisk. There is plenty of room on the FAT32 device. Unfortunately I cant´t seem to change the path to the place I want, the SDL config says it cant write to the file, though its there - I edited the file in that place after all. ROM and boot volume are there, of course - prefs edited accordingly. For the records: DroidMac never worked with my E7316 either. The SD mountpoints are a wicked mess in Android for sure! Huawei did the job by mounting the external SD as sd0, as soon as its there. Try via SDL-settings (change device configuration) select - 'Data Installation location' and then you can select another storage or specify directory. While we're at it, it would probably make sense to mainline the Aranym JIT for other platforms too, or at least compare performance. The Aranym JIT has been in development while the BII JIT has languished, meaning it's probably significantly more stable and faster on x86 as well as ARM. Thanks for caring, thats what I did, of course, when the "Change settings" is highlighted. No dice neither with default location nor with the desired one. Is there some kind of error log from the SDL? No dice with that device either. I´ll double check paths later, but I can´t believe I got it right at once on the Y300 and no luck with two tablets. I am using the same files, macrom and HD75.dsk, as you may have guessed. Another tablet, 10 inch, Android 4.4, which I had for evaluation, did the trick. I had the files installed to default location, but the SDL engine would only hand over to BII after typing in the correct path manually. had to send back the device, because of its mediocre screen. Could it be the path requester is somewhat shaky?